With this view you can see the number queued calls (left side) and Agents per Skill (right side). Each row (2 max) is a UCCUCC stands for Unified Contact Center and consists of a queue that can be handled by Agents Each Contact Center has its own settings, interactive voice response questions and Agent with specific skills. Agents can be member of, or sign up to, one or more Contact Centers. / Skill combination. 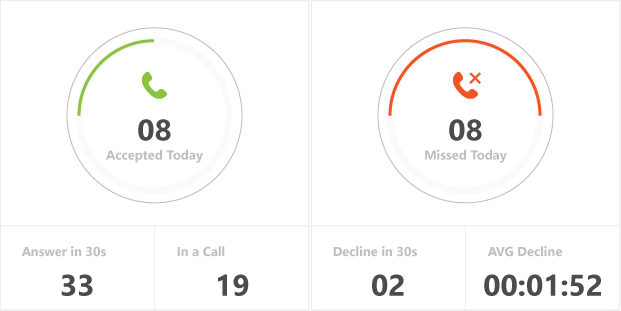 Shows the daily call statistics. 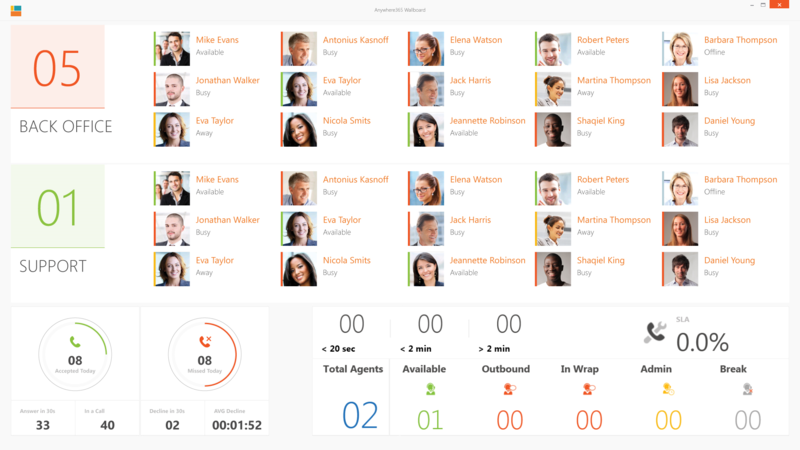 Show real-time the number of agents. All informal AgentWhen a person is set as Informal Agent it is always an Agent in the Agent circle. + All logged in formal AgentsA Formal Agent is able to sign in and sign out of an UCC. This can be achieved when the Agent sends a start or stop command to the Lync or Skype for Business client of the UCC. Only inbound calls are counted, not including forwards. Shows the SLA of the UCC today. Note that the Wallboard uses a simplified source for the statistics compared to the Dialogue Intelligence (reports). For this reason the data will not always be one-on-one the same. Dialogue Intelligence distinguishes between Missed and QuickDrop, Wallboard combines them as Missed. Dialogue Intelligence distinguishes between Inbound, Direct, Outbound, Wallboard combines them. Dialogue Intelligence distinguishes between Hunts and Forwards, Wallboard combines them.